The Grain Controversy- Are Grain-Free Dog Foods The Answer? Almost every day, I get an email or a call regarding the controversy surrounding the use of grains in dog food. In an earlier post here I discussed the use of raw diets and grains I explained why we see that some dogs do exceeding well on whole organic grains as a small percentage of their total daily intake. The quality and type of grains is also very important. In our manufacturing process we use only certified organic grains. We do not use corn, wheat or soy and the grains that we use are rare and highly absorbable. I recently came across an article written by the Great Dane Lady, Linda Arndt, who is a well respected Great Dane breeder and researcher. Her site is full of excellent information for Great Dane guardians, but many of her gems of wisdom are applicable for all dogs. While I do not agree with all of her recommendations for feeding. I think her understanding of why some grain in the diet is spot on. I get many emails asking my opinion of the new grain-free diets on the market. These are new foods and actually a spin-off of the BARF- biologically appropriate raw foods movement. 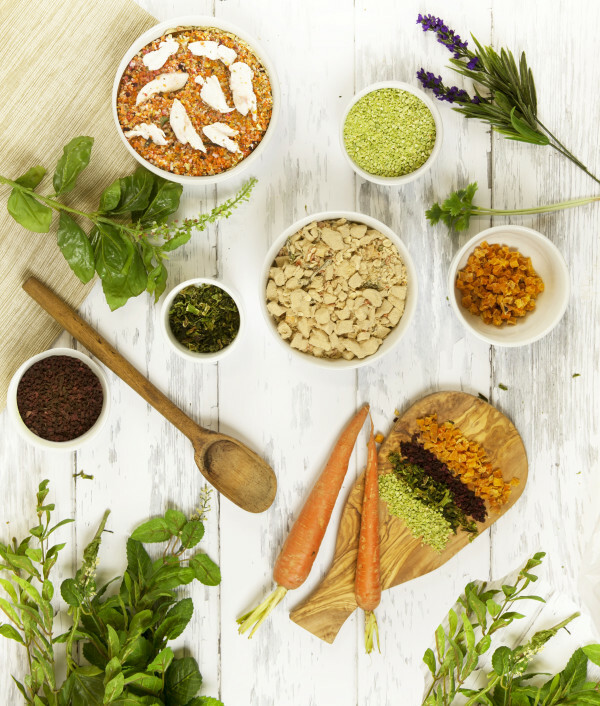 The growing holistic pet food industry has much competition these days, so they are looking for ways to reinvent the wheel and here you have it, the new grain-free diets! Thanks to knee-jerk reactions and the propagation of nutritional myths on the internet, grains in pet foods have a bad reputation. Grains are carbohydrates and carbohydrates are not necessarily bad. Just because it is a grain-free diet does not mean there are no carbohydrates in the grain-free food. Instead they substitute potatoes, sweet potatoes, yams and tapioca, as other carb sources yet tapioca is a questionable ingredient for pets. More feed trials are needed on these foods. So when people think they are using a grain-free diet, it still has carbohydrates in it and in many cases potato carbohydrates are worse for allergies, systemic yeast infections, diabetic and cancer diets – worse than quality whole ground grains used in the proper proportion. My point here is this, like most things in life, this grainless diet topic is not a black and white issue. There are many things we need to consider before using a grain-free diet for our pet’s current health situation. Now the good thing about the grain-free diets is that they are generally made by very good holistic companies like Dr Harvey’s Veg-To-Bowl among others. Most grain-free diets have not been around long enough to see how they will do in 3-4 generations. And feed trials, if actually done, are very limited. That is, other than Dr. Wysong’s diets because he is a pioneer in the field of nutrition and his products have longevity and feed trial research done on them. He is one of my heroes and I appreciate all he has done to educating us about pet and human nutrition. I do not recommend grain free diets for weaning or growth in any breed and especially for large and giant breeds. Actually, I do not recommend a grain free diet be fed as the “total diet” to any healthy breed. I even have reservations about them used totally as a cancer diet due to the high calcium levels. They are really meant for very specific uses and often for short term use – each animal’s situation would have to be considered before I could ever recommend a total grainless diet to my puppy buyers. I think grainless food is fine to use as a 5%-10% component to the adult diet using a super premium or holsitic food as the 90-95% basis of your program. For puppies past 6 months of age I would only use a couple spoonful mixed with a high quality kibble such as the Wellpet line (Eagle and Wellness foods). Once the puppy is past the difficult growth stages (weaning – 6 months) then it is ok to increase the amount fed of a grainless diet. It is IMPOSSIBLE regulate growth patterns on raw or grain fee diets in order to avoid developmental orthopedic diseases such as; HOD, Knuckling Over/Bowing (Carpel Flexural Deformity) OCD, and Pano. So Are Grains Good or Bad? There is some notion out there in cyberspace that grains are bad, when in fact grains are only bad when they were used as the basis for commercial foods, in other words grain is listed first on the label - now that’s bad. In super premium and holistic lines, grains are used as carbohydrate components, not as protein and not as filler, and that is good thing. Plus the quality of grains use in holistic and super premium lines is grade#1 Human Grade or Organic. This means low gluten components in the grains. when they are the basis for commercial dog foods (grain listed first instead of meat protein based). The biggest grain bashing problem was started by a West Coast dog food company years ago, and it had to do with corn and allergies. The fact is Human Grade #1 corn is one of the best natural sources of coat and skin conditioners like Omega 6, and it is low in gluten. It has an overall digestibility is 90% and carbohydrate digestibility is 99%. In 2005 one of the most respected holistic dog food companies decided to pull the corn from their foods only because they had pressure from consumers to do so. This decision to remove the corn was not based in any kind of research, but just because they bowed to public pressure. They removed the corn and now had a “grain-less” holistic food which is what the public clamored for in a pet food. After test feeding the diet over a long period of time they witnessed several changes in the dogs energy levels, coat and body weight. All were negative effects. The dogs had significant weight loss, it took much more food to maintain the dogs weight, coats became brittle and the dog’s energy levels plummeted, real working dogs were lacking in endurance. After seeing this results over many months of feed trial research, they decided to put the Grade 1# whole corn back into their holistic diet – as a carbohydrate source, and after thousands of bags were sold not one allergy was reported. I have found in dealing with dogs that are diabetic or have cancer, that when we totally remove the grain from the diet, their energy level plummets. So using a very high quality, high protein/fat diet with some component of whole grain is actual a good thing. Remember if it is ground whole, the fiber is intact – if there is natural fiber present, the grain does not convert to sugar in a flash, it burns slow and steady and sustains energy levels and appetites. He goes on to talk about the value of whole grains, precooked and/or freeze dried grains in a diet. The key is the diet should NOT be grain based, but instead should be based in protein from quality meat sources. 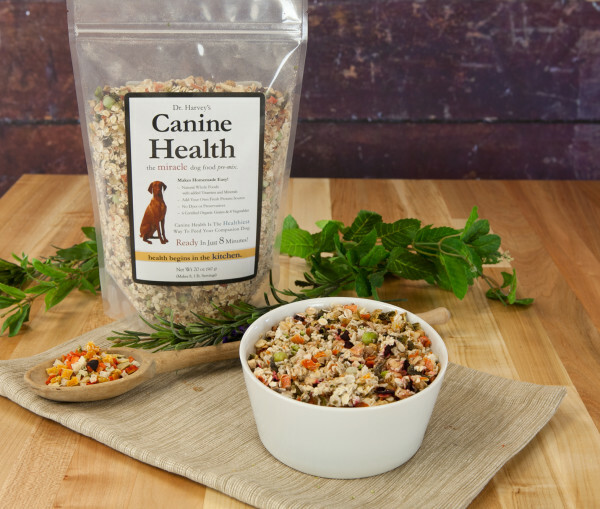 Dr. Harvey says "Some dogs do well on a completely grain-free diet, and for them I made Veg-to-Bowl , a grain-free mix of wonderful dehydrated and freeze-dried veggies. This mixture blended with meat and oils makes a wonderful grain-free meal. " He then expresses the same opinion that I have in that “some dogs do better with grains, in fact, in my experience; many, many dogs improve dramatically when using our Canine Health which has a whole grain component. We like to call the grains we use the Noble Grains and they can be mixed with raw or cooked meat”. Dr. Harvey’s company is not the only company to have found this out in feed trials. PHD – Perfect Healthy Diet has also put whole grain back into the dry food because the dogs in feed trials did not maintain stamina when working and lost weight quickly, having difficulty in maintaining their ideal weight. GRADE, QUALITY and AMOUNT and KIND of grain is the key – remember whole intact grains have all the fiber (in tact) so it is not a fast sugar burn as is refined carbohydrates. Dr. Harvey goes on to point out, “Nature made all muscle and brain function (99%) using glucose and oxygen. Carbohydrates, such as grains, are stored in the liver as glycogen, this is then released as glucose in the blood as the body requires it”. 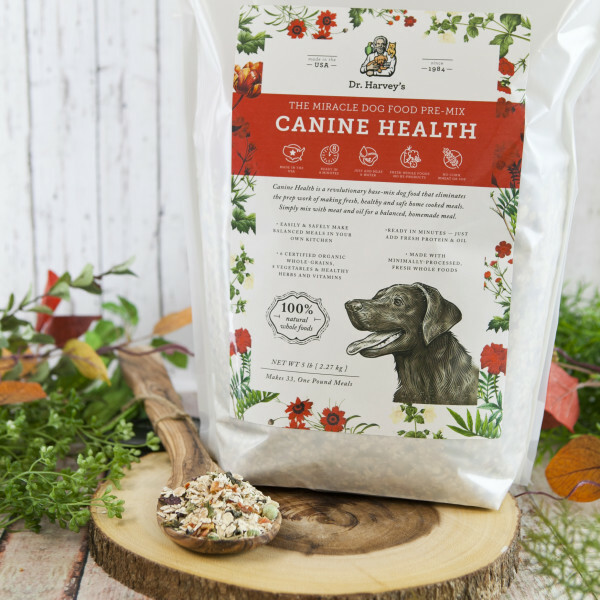 Dr. Harvey has developed 2 organic pre-mixes Canine Health, and Veg-to-Bowl, (no grain) to offer the easiest, safest and most convenient way to feed a complete raw diet. Just add water, meat and oil to either of our pre-mixes and you have a complete raw meal for your dog or cat. He also has available Power Patties – Freeze Dried Tripe. Please visit her website for health related issues. It’s a great source. Not every diet is right for every dog. Some dogs do very, very well on some grains and others need to eat a totally grain-free diet. That is why we offer two pre-mixes, Canine Health which includes 6 organic grains, vegetables and herbs and Veg-to-Bowl which is a cornucopia of vegetables and herbs. Both pre-mixes allow you to tailor your dog’s diet to give them optimal nutrition. Preparing home-made food for your dog can be a daunting process. The purpose of our pre-mixes, with or without grain, are to make this process easy and delicious. Just add meat and oil to prepare a wonderful home-cooked meal for your dog. What could be easier or better? To learn more about grain-free diets> Click Here.